Put it in the record books: Shen support beats Blitz support. Blitz was looking at making the “big play” all game. That’s why he started mana crystal instead of boots. So level 1 Shen and Sivir just ran at me, Blitz whiffed his hook and then tried to play catch-up. I don’t even need to go into detail about this game. I was +8 kills over deaths. No one else on my team was positive. Next best was top who was only -2 as Jayce. So pathetic. In team fights Renekton and Diana would just throw themselves at me. It just made me laugh that even if I used Arcane Shift and Flash I would still have a bruiser on top of me and my team would be looking at making “big plays”. I was stuck attacking Renekton through his Guardian Angel and Diana through her ridiculousness. I asked my team to peel for me. Blitz said he would. I said I needed Darius to be peeling for me in fights as well. We never had another team fight. People just got caught out and died and the game was over. I tried to pass a surrender vote, but instead two people voted no so we waited an extra 20 seconds to watch them physically destroy our base. I don’t know if people just wanted to give the other team the satisfaction of destroying more buildings or if they were too stupid to realize that the team they had fed for the last 36 minutes wouldn’t be able to drop our base that fast. No one spawned before the base was destroyed except for our AFK Elise. This was a normal game, but I’m pretty sure this is what elo hell feels like; people not knowing what they should be doing and just wanting to make “big plays” but they just fall behind in gold. 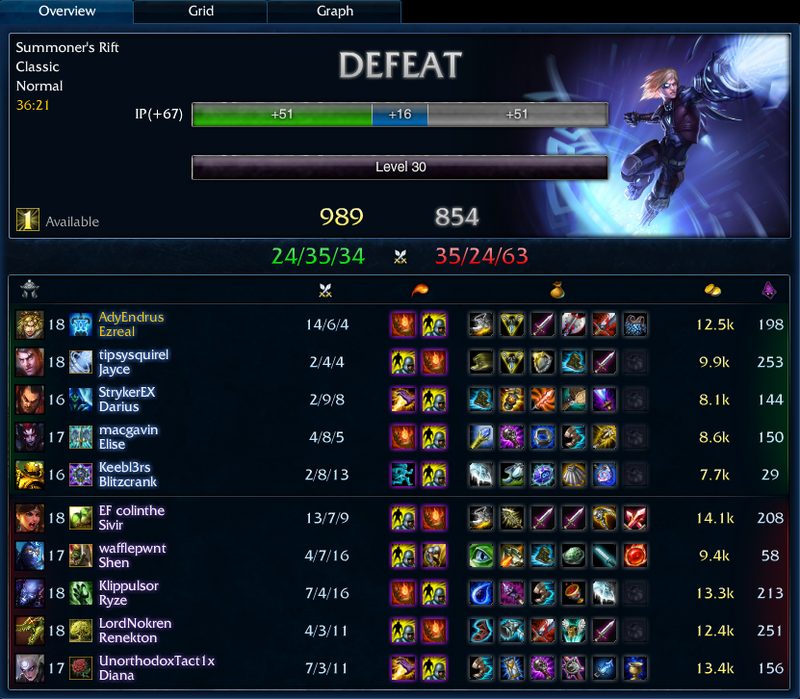 Sivir did pass me in gold, but that was after I had wrecked her in laning phase. She managed to pick up four kills right near the end of the game as my team got caught out. She had a better team, I had a better K/D.